No, this isn't the Twilight Zone. Or maybe it is. F Short fiction N + No monetary payment. Royalties. There is also an entry on Horror Tree stating there would be 5% royalties after costs. Skarett's Treasure is a pirate story told from the point of view of one of the characters who happens to be dead. I submitted just before the May 30th (2013) deadline and it was eventually accepted. The story was supposed to be published in an anthology called Dead Men's Tales sometime toward the end of 2013. Then I heard it was supposed to be published in July of 2014. Then I heard it was supposed to be published toward the end of 2014. Then I heard, well—nothing. In fact, I heard a whole lot of nothing for a very long time. I e-mailed, but never received a response from the editor or Fringeworks. In the meantime, another story I had submitted to Fringeworks (and had accepted) called The Fisherman and his Wife, was published, also much later than planned, in Grimm and Grimmer III. You can buy it on Amazon, though few people know about it as neither the publisher nor the other authors seem to have done anything to promote the book. I'd love to show you the contract I got with that deal, but I can't. I don't have one. They never even told me when the book was available. I found it on Amazon by accident. Edited by Mellissa Black, DEAD MEN’S TALES is another of those infuriatingly slow books in happening. Originally scheduled for publication in July 2014, it has been slowly progressing towards publication ever since. 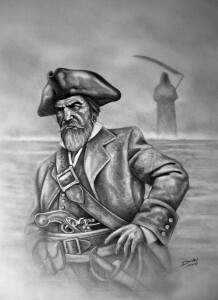 The anthology will focus on the pirate stories told from the perspective of the dead. Cover: Blackbeard, copyright Darrel Bevan, 2014. Interesting. Despite what they say, the original publication date was long before what they have listed. 2014 was the "amended" date. I have serious doubts that I will ever see any royalties since there has been little (nothing?) in the way of promotion of their books, and even if it sold like hotcakes (I remember Moe of the Three Stooges saying this a lot, and it seems appropriate) the chances are slim and none. I have no official contract with them. It would be a shame for Fringeworks to simply publish Dead Men's Tales with no marketing and let it fall into obscurity, especially after all the work they (and the authors) have put into it. Artist Darrel Bevan was hired to produce the cover. I like his work, and the image is appropriate even though the cover won't be as colorful as most books today. They've even managed to get actor Kevin R. McNally to write the foreword for this book. He is one of three actors who have starred in all four of the Pirates of the Caribbean films. Unfortunately, I'm afraid this may be what happens if it ever gets published at all. It's been over two years since I started this adventure. I can't even remember the character's names! I sure hope it's a decent story. Do I think the Fringeworks folks are evil? No. In the beginning, they were very responsive and appeared to be working hard at getting out quality books. I think they tried to do too much and got in over their heads. There may have been some internal personality issues, too, but I can't say for sure. And they did have problems when the original cover artist left, and possibly with the separation of Knightwatch Press. I never did get a lot of details on this. That being said, I won't be submitting anything new to them until they show they've got their act together, and I really hope they manage to pull it off. But a blog post once every six months and a tweet every year isn't the kind of communication you need from your publisher. For the moment, there are too many better options out there. I took a little walk around Mercer Lake yesterday. I had to get away from things for a while and partake in a bit of exercise. The loop around is about 4 miles, so that should do it for this year. All I had was my phone camera with me, so the pics aren't the highest quality. But they are free for you to use! 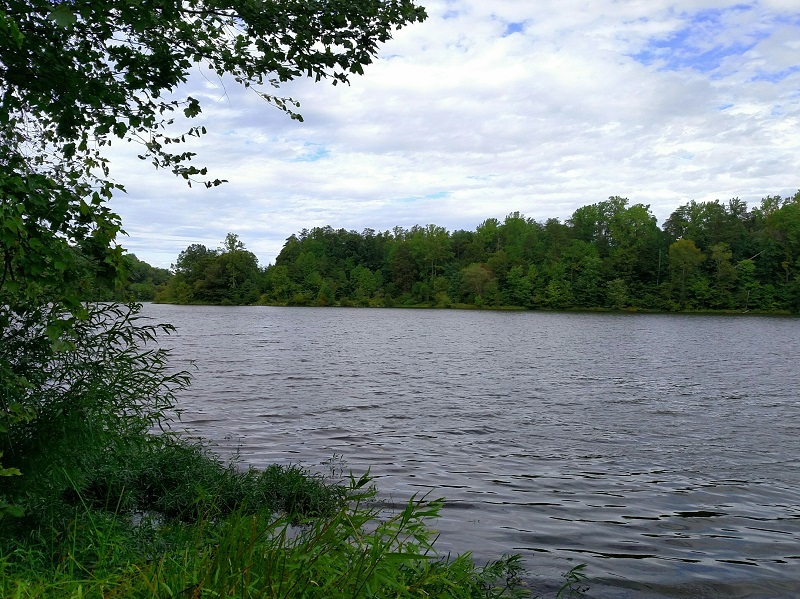 It always amazes me how many trails, ponds, and lakes there are in the DC suburbs, and that in such a densely populated area it is still possible to find (somewhat) natural places to which one can escape. At the spot where I stood for the first photo, not a single house was in sight. Although it's late in the year, there are still a few flowers blooming. 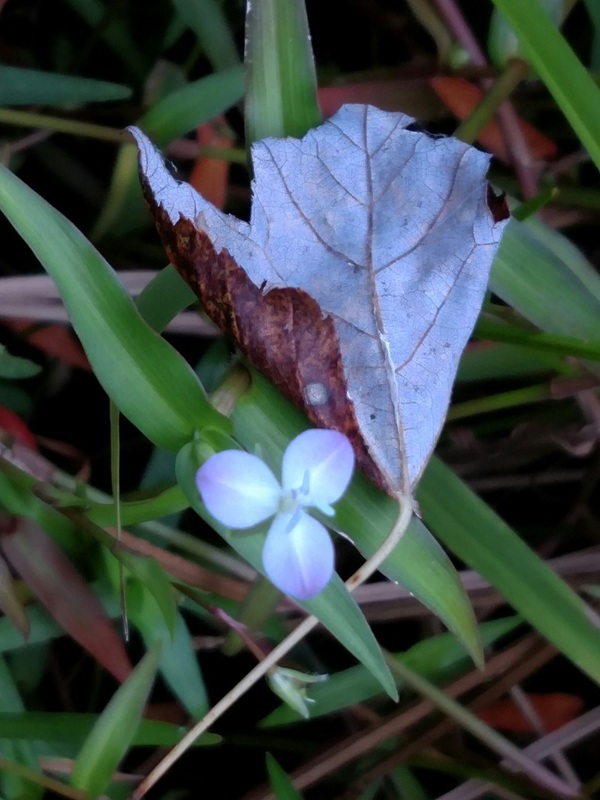 I have no idea what this little blue one is. 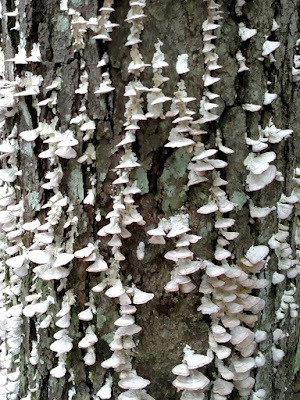 And I couldn't do a picture post without a few mushrooms sprouting from an old tree trunk! Images MERCER_LK.jpg, ML_BLUE_FLOWER.jpg, ML_TREE_FUNGUS.jpg ©2015 K. R. Smith - www.theworldofkrsmith.com - may be used, in whole or in part, with attribution.